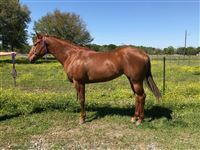 She is a very sweet mare to be around and stands calm for hair clipping, farrier, etc. Knows fundamentals, has been exhibitioned, and now is recently being entered. She has clocked 2d-4d with a handful of times being entered. She clocks very well for cruising. Has a big heart, a lot of try, and a lot of potential. She has a long stride. She has been a fast learner! Has also been slow worked on poles. Sound.. have current x rays.